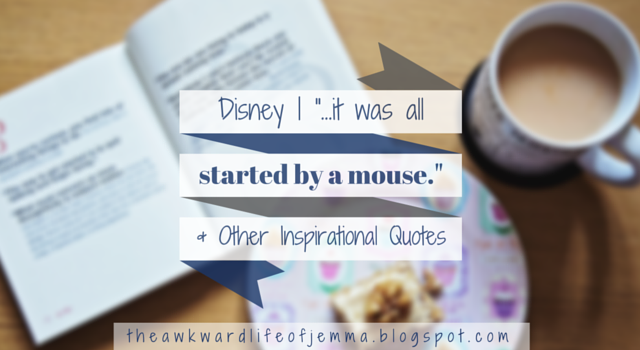 In today's Disney themed post I am bringing you inspirational quotes from the main man himself, Walt Disney. As I'm sure I've mentioned on this blog before I am a huge fan of Walt Disney, not just a Disney fan. I've read his biography (the one by Bob Thomas, it's great I highly recommend it if you want to find out more about Walt's life and the creation of Disneyland) I've visited the 'One Man's Dream' attraction at Disney's Hollywood Studios and the one thing that always come across is that Walt Disney had an amazingly positive and unique outlook on life. 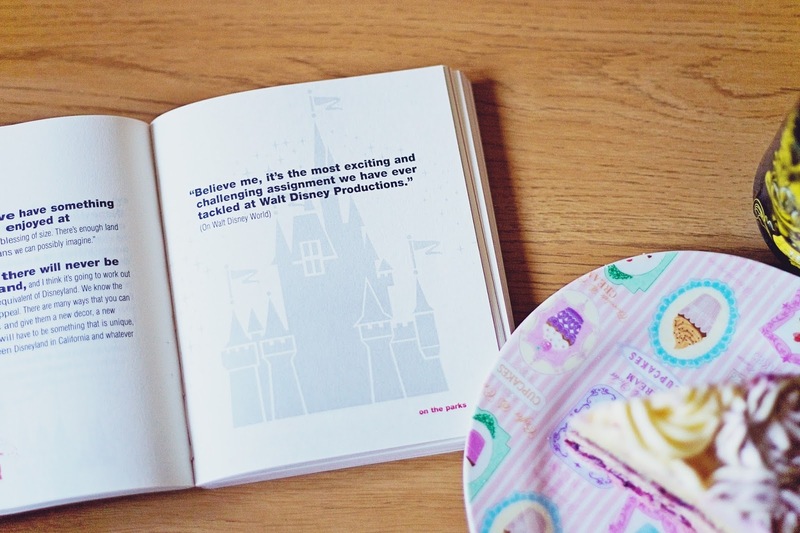 I can't remember whether it was Harry or me that picked up this book while we were at Walt Disney World but somehow The Quotable Walt Disney' came into our possession. As you can probably guess this book is stocked full of quotes from the man himself and is organised into a huge number of categories (it seems Walt had something to say about everything!). You'll find his thoughts on things such as 'Films and Animation', 'Mickey Mouse' as you'd expect but also on 'Education' and 'Progress and Innovation' and 'Success and Failure' which you might not. 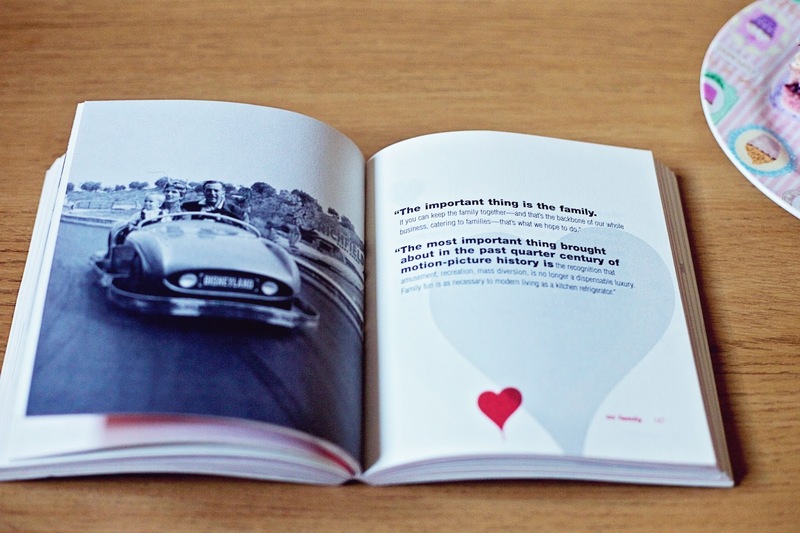 Open the book on any page and you'll find a quote that is enlightening and insightful. Obviously it's probably not a book that you'll read cover to cover in one go but it is great to pick up if you have a spare moment, perhaps with a cup of tea and a slice of cake (at least if you're me!). It's a handy size, easy to flick through and every now and again you'll find beautiful black and white photos too. It's a thick book too, I'm not sure how many quotes are included but definitely isn't lacking. Some of the most poignant quote are those about success, the future and working towards your dreams. You might not know it but Walt experienced a number of hardships and failures in his life but he worked extremely hard and always had a vision of how it wanted things to be. It really is a lovely book and perfect if you need a bit inspiration as us bloggers do from time to time. If you like Disney or if you're just into quotes then I think you'd love this book or if you have another Disney lover in your life I also think it would make a great gift. There are a lot of novelty books that come out at this time of year for stocking fillers or silly gifts that are suggested for reading on the toilet which probably never get read but this is one that could easily be left out on a coffee table or on your bedside table for a bit of light reading. It's available on Amazon for £7.99 and you can even look inside to see a whole number of the quotes for yourself.